Strawberry Orange Ricotta Chia Seed Muffins are packed with ricotta cheese, fresh strawberry chunks, chia seeds and plenty of citrusy orange flavor. 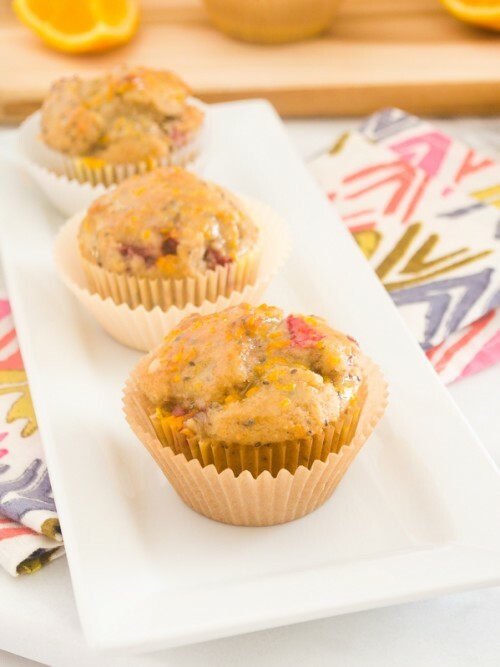 Enjoy them with or without the glaze for the moistest healthy muffins ever! Preheat the oven to 400 degrees. Line a standard muffin pan with 12 paper liners and spray them lightly with cooking spray. Set aside. In a large bowl, whisk together the flours, baking powder, baking soda, salt, and ground cinnamon. Set aside. In a medium bowl, whisk together the brown sugar, granulated sugar, coconut oil, and eggs until frothy, about 1-2 minutes. Whisk in the orange zest, vanilla, ricotta cheese, and chia seeds until incorporated. Add the wet ingredients to the dry ingredients, stirring just until combined. In a small bowl, combine the chopped strawberries with the remaining 2 tablespoons of flour until well coated. Gently fold the strawberries into the muffin batter. Fill the muffin liners with the batter, which will almost reach the top. Bake for 18-20 minutes, or until golden brown and the muffin tops spring back when pressed gently with your finger. Cool 5-10 minutes in the pan on a wire rack, then remove from the pan and cool completely. Combine the powdered sugar with 1 tablespoon of orange juice and the zest. If you like your glaze thinner, add another half - 1 tablespoon of the remaining orange juice. Spoon the glaze over the cooled muffins and allow to set. Serve and enjoy! *The white whole wheat flour may be substituted with all purpose or whole wheat flour. *The coconut oil may be substituted with canola oil. These muffins are fabulous as-is, so the glaze is completely optional!